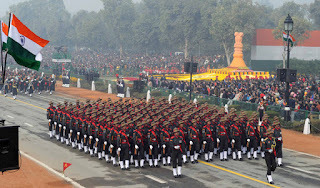 The results of different competitive presentations in the Republic Day Parade – 2016 have been announced by the Ministry of Defence. Among the Services category, Assam Regiment has been adjudged the best marching contingent. In the category of Para-Military Forces and other auxiliary marching contingents, Border Security Force contingent has been adjudged the best contingent. In the tableau category, in total 23 tableau including six from Union Ministries / Departments took part in this year’s Republic Day Parade, out of which first position has gone to West Bengal tableau, which depicted the famous Baul folk singers rendering the songs based on Bhakti and Sufi movement. While Tripura’s tableau on beautifulUnakoti sculptures, seen in a Shiva pilgrimage site was adjudged the second best, third position has gone in favour of Assam tableau showcasing the popular Rongali Bihu festival. This year a special prize has been awarded to the tableau of Ministry of Communication and Information Technology on the theme ‘Digital India’. In the competitive category of school children items, the dance presented by South Central Zone Culture Centre, Nagpur (Maharashtra) has been adjudged the best children item for performing the folk dance ‘SongiMukhota’ of Maharashtra. A Consolation Prize has also been awarded to SarvodayaKanyaVidyalayaand RajkiyaPratibhaVikasVidyalaya, Gandhi Nagar, Delhi, for their beautiful portrayal of traditional Folk Dance ‘Dal Khai’ seen in Western Odisha. As in previous years, this year also Ministry of Defence had appointed three panels of judges for assessing the marching contingents from three Services, Para-Military Forces and Tableau from various States/Ministries/Departments and School Children items from Schools of Delhi as well as outside Delhi. The panels of judges today announced their results here. All these above winning contingents, tableau and schools will be awarded trophies and prizes by the Defence Minister later in separate functions organised by the Ministry of Defence. 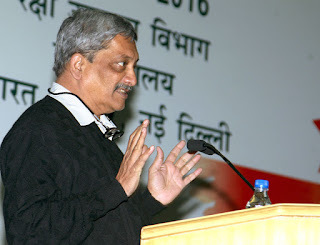 The Defence Minister Shri Manohar Parrikar gave away the RakshaMantri Awards for Excellence for the years 2012-13 and 2013-14 here today in recognition of exemplary performance amongst Ordnance Factories and the nine Defence Public Sector Undertakings (DPSUs). Speaking on the occasion Shri Parrikar call upon the DPSUs to compete with the private sector. He emphasised that the government’s efforts are to indigenise production. He further stated that based on his experience government is a powerful institution which can effectively deliver in a restricted timeframe, while following the procedures. The awards were given in three major categories, i.e., ‘Institutional Awards’, ‘Best Performing Division/Factory/Shipyard Awards’ and ‘Group/Individual Awards’. Under the Institutional awards, there are two sub-categories for which DPSUs and OFB can compete i.e. overall performance and performance in exports. In the second category, there are three awards; for the best performing division of DPSUs, the best performing factory of OFB and the best performing shipyard. In the third category, there are three sub-categories – one on indigenization, one on design effort and one on innovation for which both OFB and DPSUs can compete. MI-17 Team – MIDHANI, Hyderabad. The function was attended by the Chief of Air Staff Air Marshal Arup Raha, Chief of the Army Staff General Dalbir Singh, Chief of the Naval Staff Admiral RKDhowan, Secretary (Defence Production) Shri AK Gupta and Secretary Department of Defence R&Dand DG DRDO Dr S Christopher. On 26 Jan 16, Indian Air Force Radar had picked up an unidentified flying object moving easterly in Jaisalmer Area. An Indian Air Force fighter jet intercepted the object which was found to be balloon of about 3 meters diameter. Due to heightened security alert, the balloon was shot down as it would have been carrying unknown payload. However, on analysis of the debris it was established that there was no dangerous payload.